Explanation: Delivered by Saturn-bound Cassini, ESA's Huygens probe touched down on the ringed planet's largest moon Titan, ten years ago on January 14, 2005. These panels show fisheye images made during its slow descent by parachute through Titan's dense atmosphere. Taken by the probe's descent imager/spectral radiometer instrument they range in altitude from 6 kilometres (upper left) to 0.2 kilometres (lower right) above the moon's surprisingly Earth-like surface of dark channels, floodplains, and bright ridges. But at temperatures near -290 degrees F (-180 degrees C), the liquids flowing across Titan's surface are methane and ethane, hydrocarbons rather than water. After making the most distant landing for a spacecraft from Earth, Huygens transmitted data for more than an hour. 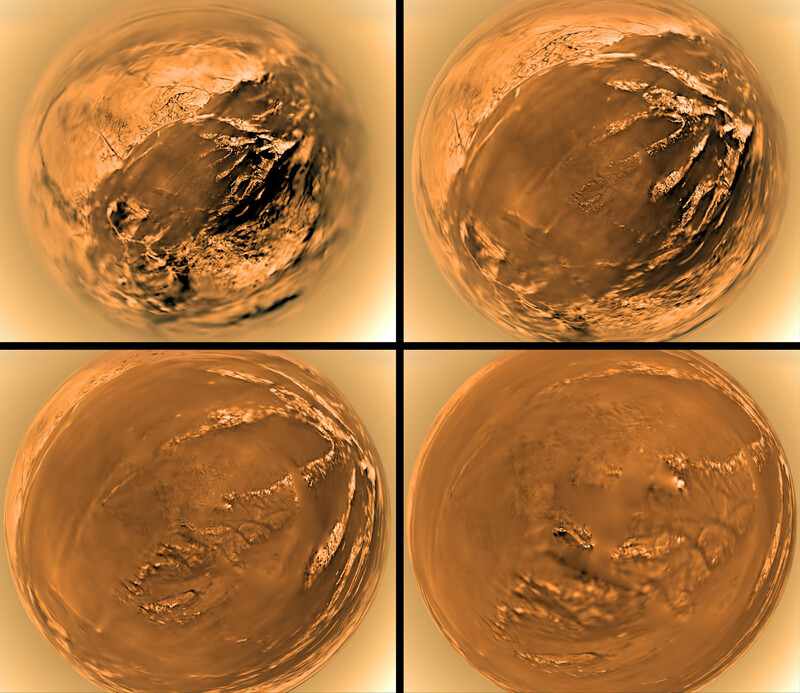 The Huygens data and a decade of exploration by Cassini have shown Titan to be a tantalizing world hosting a complex chemistry of organic compounds, dynamic landforms, lakes, seas, and a possible subsurface ocean of liquid water.